M. A. in Nepalese History, Culture and Archaeology (Tribhuvan University, Nepal). Centre for Nepal and Asian Studies, Tribhuvan University, Kirtipur, Kathmandu, Nepal. 2009 to present Professor of Nepalese Culture and Archaeology at Centre for Nepal and Asian Studies, Tribhuvan University, Kathmandu. 1998 to 2009 Associate Professor at Centre for Nepal and Asian Studies, Tribhuvan University, Kathmandu. 1993-1998 Lecturer at Centre for Nepal and Asian Studies, Tribhuvan University. 1993 (for three weeks) Assistant Researcher of Art and Architectural Study of Western Nepal, sponsored by CNRS, Paris, France. 1993 Part time Consultant on National Heritage Conservation Program, IUCN/Nepal. 1986-1993 Assistant Lecturer at Centre for Nepal and Asian Studies, Tribhuvan University. 1992 Part time Consultant on National Heritage Conservation Program, IUCN/Nepal. 1987-1992 Part time Lecturer at Patan Multiple Campus, Tribhuvan University. 1990-1991 Part time Lecturer at Central Department of Nepalese History, Culture and Archaeology, Tribhuvan University. 1989-1990 Assistant Researcher in the Remote Area Development Project, sponsored by UNDP. 1982-1986 Assistant Lecturer at Tribhuvan Multiple Campus Palpa, Tribhuvan University. 2018(V.S. 2074) Chad parva ko Ghar Nepal (in Nepali) (with others) Kathmandu: Nepal Academy. 2016 Sankhu Historical and Cultural Heritage (with Tek Bahadur Shrestha) Kathmandu: Centre for Nepal and Asian Studies, Tribhuvan University. 2012 Heritage of Western Nepal Art and Architecture Kathmandu: Centre for Nepal and Asian Studies, Tribhuvan University. 2012 The Wedding in Nepal (with Korean authors) Seoul: The National Folk Museum of Korea. 2004 Gandakiprasravan Kshetraka Sanskritsmpada, Kala ra Vastukala (Cultural Heritage of Gandaki region: Art and Architecture) Kathmandu: Centre for Nepal and Asian Studies. 2001 Paschim Nepal Ko Murti tatha Vastukala (Art and Architecture of Western Nepal) Kathmandu: Royal Nepal Academy. 1998 Nepal Ko Killa Vastukala (Fort Architecture of Nepal), Kathmandu: Centre for Nepal and Asian Studies. 1996 Nepal Bahira Nepali Sahitya ra Samskriti (Nepalese Language and Culture Outside Nepalese territory), Kathamndu: Sajha Publication. 1989 Prarambhik Puratatto Vigyan (Elementary Archaeology) Kathmandu: Dilli Raj, Pradip Nath. — 2014 “Dang Upatyekako Puratattwik Mahattwo” (Archaeological importance of dang valley) Milan Bindu vol.2 no.2 National Cultural Study Centre, Nepal Sanskrit University. — 2007 “Religious and Cultural Values of Himalayan Wetlands” in Bishnu Bhandari and Gea Jea Joo (eds) Himalayn Wetlands, Risk, Challenges and Opportunities, Korea: Ramsar Wetlands Centre. — 2007 “Khasa: an indigenous Chhetri group of Karnali region” Chhetri Udgar Souvenir-1, Central Committee, Kathmandu. — 2005 “Gosaikunda: A high altitude wetland and its cultural values” Asian Wetlands Symposium 2005 Innovative Approaches to Sustainable Livelihood Bhubaneswora: Chilika Development Authority. — 2001 “Cultural Heritage of Nepal“The Kathmandu Post 14 March 2001. — 2000 “Simraungarh sthit Shakti Devi ka Murtiharu”(Shakti images from Simraungarh) Voice of Culture vol iii Sept/Oct. — 1999 “Socio-economic Status of Bhand”(Nepali) in Dilli Ram Dahal (ed) Nepalka Kehi Pichhadiyaka Jatiharuko Samajik Arthick AdhyayanKathmandu: Centre for Nepal and Asian Studies, Tribhuvan University. — 1999 “Remote Bajhang, Its Unique Culture” Nepal Traveller October. — 1997 “Samskriti Sampada ra Yesko Samrakshan” (Cultural Heritage and Conservation” Jamara, Dashai Souvenier, Tinkune Kathmandu. — 1996 “A note on the Historical and Cultural Significance of Vajrayogini of Sankhu”Contributions to Nepalese Studies, Vol. 23, No. 1. — 1996 “Swojatiya Gaurab ka Pratik Master Mitrasen” (Mastr Mitrasen as the pride of Nepali Community) Madhupark vol.29 no.8 (Paukha). — 1996 “Nepal ka Takshar haru” (Mints in Nepal) Koseli(Kantipur), Mansir 16, 2052 V.S. — 1995 “Some Important Festivals of Nepal and their Cultural and Touristic Importance” Everest Nepal Vol. 4, No. 2, Nov-Dec, In-flight Magazine. — 1994 “Ihi: A Pre-maturity sacrament of Newar Girl” Everest Nepal vol.2 no.4(July-August). — 1994 “Three Documents regarding the Economic Condition of Udayapur Pyuthan” Rolamba Vol. 14, No. 1, (Jan-March) Journal of the Joshi Research Centre. — 1992 “Nepal Bhutan Dharmik ra Samskritik Sambadha Badhauna Swayambhu Chaitya ra Gumba ko Bhumika”(Role of the Gomba and Chaitya of Swoyambhu for strengthening the religious and Cultural ties between Nepal and Bhutan) Contributions to Nepalese Studies Vol. 17, No. 2. — 1992 “Bhakshuko Yatra Masterko Ghar Samma” (A journey to Bhakshu destination to the house of Master) Garima, A Journal of Sajha Publication. — 1992 “Samskriti ko Samrakshen Kasari garne”(How to preserve our Cultural Heritage) Gorkhapatra, Saturday Supplementary, March 29, 1992. — 1989 “Aitihasik Gaurab ko thalo Nalapani”(Historical Pride of Nalapani) Gorkhapatra, Saturday Supplementary, April 22, 1989. — 1989 “Archaeological Remains of Dang Valley” Ancient NepalNo. 106 (June-July) Journal of the Dept. of Archaeology. — 1988 “Prasiddha Tirthasthal Devaghat”(Devaghat: A Sacred Place) Garima Vol. 6, No. 7 Journal of the Sajha Publication. — 1987 “Rishikeswora of Ridi”, Rolamba Vol. 7, No. 4 (Oct-Dec.) Journal of the Joshi Research Institute. — 1987 “Nepal ma Navapasan Yuga ko Khoji ko Sandarba ma Palpa ma Prapta Navapasankalin Aujar” (Neolithic Tools from Palpa District) Nepalese CultureVol. 6. — 1987 “Sristi ko Pratik Linga Pooja”(Linga Worship as a Symbol of Creation) Ancient Nepal No. 89-90 (Feb.-May), Journal of Dept. of Archaeology. — 1986 “Dang ka Siddha Ratnanath”(Ratnanath of Dang Valley) Nepali SamskritiVol. 2, No. 3 Journal of Samskirit Samsthan. — 1982 “Dang ma Prapta Navapasan Kalin Aujar”(Neolithic Tools from Dang Valley) Gorkhapatra,Saturday Supplementary, Sept. 3, 1982. Project Reports: Sharma, Dilli Raj ——————- —————— —————— ——————– 2019 2018 2017 2015 2015 Kirtipur Nagarpalikaka Aitihasik tatha Sanskritik Sampadha, submitted to Nepal Bhasha Academy, Kirtipur, Nepal. Vishowavidhyalaya Sambandhan Vyabastha Adhyan Prativedan, 2075, submitted to University Grants Commission, Sanothimi, Bhaktapur, Nepal Lumbini Baudha Vishovidyalaya bisayek adhyan prativedan, 2073, submitted in University Grants Commission, Sanothimi, Bhaktapur, Nepal. Chaad Parva ko Ghar Nepal (Nepal, the House of Festivals) sponsored by Nepal Academy, Kamaladi, Kathmandu. Submitted the Research Report on Intangible Cultural Heritage of Tokha to Ministry of Culture and Tourism, Nepal Government, Simhadarbar, Kathmandu. ————- ————- ————— ————— ————— 2014 2012 2011 2007 2005 Historical, Cultural, Ethnic and Linguistic Studies of Dolakha Sponsored by University Grants Commission, Nepal Cultural Heritage of Bagmati River Corridor submitted to University Grants Commission, Kathmandu. Ritual for the Ancestors (sang jaerye): A Comparative Study of Korea and Nepal submitted to The National Folk Museum of Korea, Seoul. Community Based Conservation System in the Kathmandu valleysubmitted to UNESCO Office, Jawalkhel, Lalitpur, Kathmandu. Sacred Landscape of the Himalayas: A Pilgrimage from Triveni to Muktinath of the Gandaki Region in Nepal submitted to Nepal National Commission for UNESCO, Ministry of Education and Sports Kaisar Mahal, Kathmandu. ————– 2004 Identification and Analysis of Community Based Care Centre Facilities and/or Practices for children in need for Special Protection in Nepal, Sponsored by UNICEF, Nepal. ————— 2003 Developing Web Content Premised Around Nepalese Culture, submitted to National Information Technology Centre, Simhadarbar, Kathmandu, Nepal. ————— 2002 Ancient town Sankhu: A study on History, Culture, Art and Architecture, submitted to UNESCO, Division, Nepal. ————— 1993 Cultural and Historical Survey of Budhanilkantha (Nepali) Submitted to CNAS, T.U. —————- 1990 Monuments of Kathmandu Valley and their Contributions in the relationship with neighboring countries of Nepal (Nepali) submitted to CNAS, T.U. ————— 1989 Impact of Nepalese Culture and Language in the neighboring countries of Nepal (Nepali) submitted to CNAS, T.U. Sharma, Dilli Raj —————- 2017 1996 Submitted the report on Prospect of Tourism Development of Khaptad, Badimalika and Ramarosan of Doti, Bajura and Achham districts of Western Nepal, submitted to Nepal Tourism Board, Bhrikutimandap, Kathmandu Submitted the report on Cultural Importance of Wetlands of Nepal to IUCN/The World Conservation Union, Nepal. —————- 1993 Submitted the Introductory Reports of the Cultural Heritage sites of Nepal to IUCN/The World Conservation Union, Nepal. —————- 1992 Submitted various entries on the subjects of Culture and Archaeology toCultural Encyclopedia Nepal. Sharma, Dilli Raj —————– ————– ————— 2014 2013 2013 2005 Intangible cultural Heritage: Challenge on its conservation, Paper Presented on Introductory Seminar of Intangible Heritage of Nepal, Organized by National Ethnology Museum, Kathmandu Jestha 5-6, 2071 (May 19-20, 2014) Archaeological Importance of Dang Valley,Paper presented on Cultural Heritage of Dang Valley, organized by National Cultural Study Centre, Nepal Sanskrit University, Dang from 8 to 9 December 2013. The Life of Buddha in stone sculptures of Western Nepal, Paper presented on International Symposium on Safeguarding Lo Mustang organized by UNESCO, Himal Asia Foundation, Kathmandu University from 1 to 3 November 2013. ‘Holy Water of Gosaikunda: A Pilgrimage to High Altitude Wetland’ Paper presented on National Workshop on High Altitude Wetlands of Nepal Kathmandu, Nepal, September 30, 2005,. —————- 2005 ‘Gosaikund: A High Altitude Wetland and its Cultural Values’ Paper presented on Asian Wetland Symposium Bhubaneswora, India. Feb 6-9, 2005. —————- 2000 ‘Cultural Heritage of Simaraungarh’, paper presented on the seminar held in Simaraungarh Organized by Royal Nepal Academy, Kathmandu. —————- 1998 ‘Cultural Heritage of Nepal and their Conservation Status’, paper presented on VSMM 98 Conference, Gifu, Japan, Nov. 18-22, 1998. ——————– ——————– 2011 2003 Cultural Partnership Initiative Program Organized by National Folk Museum of Korea, Seoul from June 2011 to November 2011. Asian Academy for Heritage Management 1st Annual Field School, organized by UNESCO/ICCROM in Macao, SIR, China, from 22 November to 6 December, 2003. The proposals prepared by myself were also accepted in competition and able to receive the projects, on which I accomplished the project as a leader or co-ordinator. ‘Establishing Research Cell in CNAS’ (2010) from UGC, Nepal. These are the example of my pleading capacity in competition market. Rastriya Pratibha Puraskar (National Talent Prize) in 2070 VS (Ministry of Culture and Tourism, Government of Nepal). Advisory Board Member of Contributions to Nepalese Studies (CNAS Journal), Tribhuvan University. 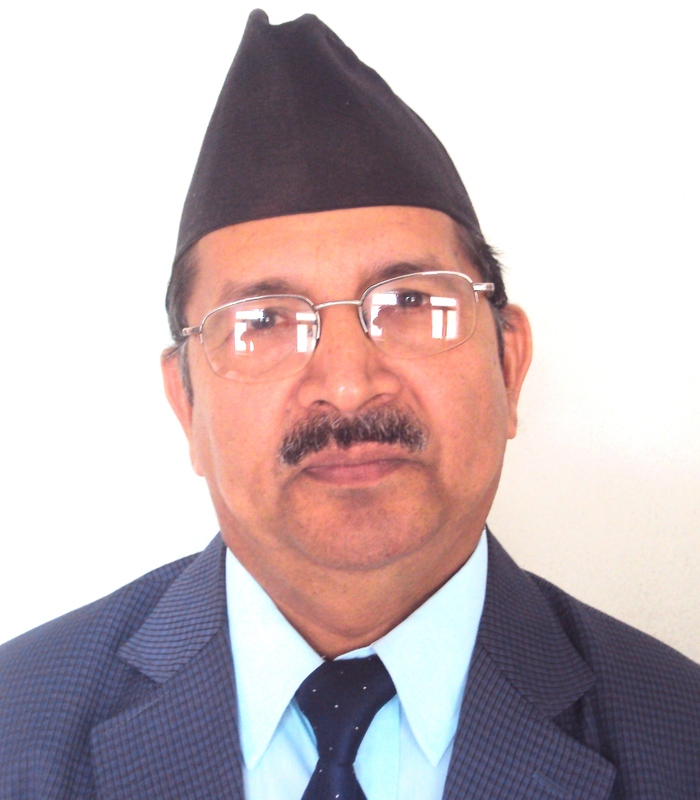 General Secretary in ‘Historical and Cultural Heritage Association, Nepal’. Member of Advisory board of Heritage Preservation Movement, Nepal. Member of the Subject Committee, University Grants Commission, Sanothimi, Bhaktapur. Languages : Nepali, English, Tharu, Hindi.